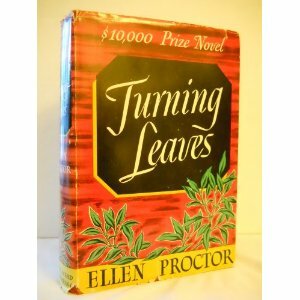 Candlelight, beautiful antiques, and famous old paintings form the setting for a best seller- "The Turning Leaves" by Ellen Proctor. The theme centers about a typical American family with a long line of American ancestors which were remembered for their many and varied achievements. The father, James IV, didn't inherit this ambitious ability to forge ahead and as a result is just a lawyer of little renown. The mother is an uncolorful personality, living mostly in the past, centering all her energies in bringing up her children—seven in number. The experiences of these children, who had inherited all the spirit and fire that their parents lacked, are told in a most extraordinary manner—extraordinary in that they are narrated without obvious fiction, making one feel the comparison to personal experiences. The two main characters, Julia and Gabrielle, were the fourth generation of daughters to bear these names. Julia has a strange driving ambition with no particular talent while Gabrielle has talent—her voice pointing her toward opera-- but she lacks the ambition to force her to that goal. Julia and Gabrielle unconsciously face the same problems, dream the same dreams, and experience the same joys and sorrows that shaped the lives and molded the destinies of the other Julias and Gabrielles that preceded them. They cannot see this repetition but their father who had studied records of his ancestors, can see these likenesses reflected in the lives of his daughters and ponders over them. The affect of this rich, yet strange American heritage upon these children, is given in one of the most delightful books, "The Turning Leaves." A $10,000 Prize Winning Novel This story sweeps you along in the turmoil of daily activities of a large, boisterous family. You will be most affected by its laughter and its lusty living. Identity and Culture Crisis: White or Black?